I spoke with Lorraine Ball this morning about the 4-Points model I talked about in my post, Being Productive with Social Media. She had some excellent ideas that rounded out the model to perfection. Anymore thoughts would be greatly appreciated. KyleLacy.com » Blog Archive » Online Social Networking. Impersonal? for all of your hard work! 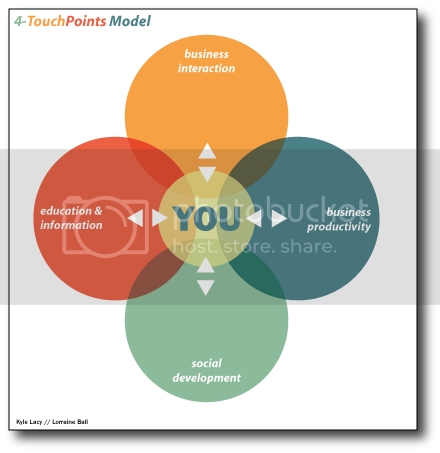 Adjustment to 4 touchpoints model of social media.. Huh, really? You’ve hit the ball out the park! Icrndeilbe!